What is the cost to the United States and its economy if in 20 years more than 40 percent of the Latino population is not finishing high school and limiting their potential? And how does the United States prosper if the fastest growing segment of the population is suffering from high drop-out rates, large numbers without health insurance, and under-representation in leadership and key innovation and job growth sectors? By 2030, if projections hold, there will be 84 million Latinos living in the United States, accounting for 25 percent of the population. The growing Latino community in America is no longer a secret. It is well-known that Latinos are the fastest growing segment of consumers, the workforce, and the tax-base. With this growing population comes a growing responsibility to ensure it is prepared to lead our nation. The future success of the United States is directly tied to the success of the Latino community. Despite growing numbers, Latinos remain underrepresented in most sectors and at all senior levels. To ensure Latinos do not fall further behind, CHCI recently launched a workforce development and pipeline strategy entitled Towards 2030: Latinos Leading in a Global Innovation Society. For more than 30 years, CHCI has provided opportunities for young Latinos and is the only national Latino organization that offers a Congressional internship program, fellowship programs, scholarship awards, and a college readiness program for high school students (www.chci.org). This comprehensive approach is proven to help students succeed in their education, attain valuable work experience, and open the doors of opportunity for young professional in a variety of fields. With our investments in technology, CHCI is seeing the number of its program applicants soar to more than 10,000 interested individuals annually. This represents the vast number of untapped talent that lies in the Latino youth population looking for opportunities. Our nation is experiencing unprecedented shifts in technology, the economy, and demographics. Furthermore, recent studies indicate that in today’s global innovation economy, 90 percent of the fastest-growing and highest-paying jobs require some postsecondary education. Under the leadership of Chair Nydia Velázquez (NY-12), this strategic plan will focus on working with industry leaders to provide resources for investment in a workforce pipeline.Why is this strategic plan necessary? Currently, Latinos have a 40 percent high school drop out rate---more than four times that of non-Hispanic whites. Current figures indicate that Latinos make up one out of every three new entrants into the labor force. By 2025, this number is expected to be one out of every two. Access to quality education and educational attainment among Latinos is necessary for us to remain competitive.Workforce-readiness among Latinos will directly impact the United States’ ability to generate economic activity and tax revenue to care for its elderly and its poor. Latino leadership in government is critical to implement policies that address issues that affect the Hispanic community and in private industry as they can directly influence corporate market responsiveness, consumer behavior, and economic prosperity. CHCI is uniquely positioned to bring together current and future leaders. With this leadership development model we can open more doors to success and elevate 2030 workforce development themes in to the national agenda. Working with industry leaders in all sectors---public, private, labor and non-profit---CHCI will impact four strategic areas: First, by growing CHCI’s proven leadership development programs that directly impact the workforce pipeline for qualified, talented Latinos. Second, by leveraging CHCI’s annual conference and other national policy forums to address workforce issues. third, by increasing opportunities for young Latinos through the creation of a Career Link service, linking young professionals with internship and employment options.Finally, by benchmarking and measuring success in 2015, 2020, and 2030 to ensure Latino inclusion in pipeline and workforce development initiatives by sector and industry. The Towards 2030 strategic plan is providing resources and solutions to industry leaders to develop a pipeline of strong, talented Latino workers that are ready to fill jobs in the new economy. We must prepare our workforce so that it is prepared for future job growth areas such as green jobs and technology ---we must be prepared for the Innovation Economy that will drive the future economic growth of this country and the world. As the United States experiences unprecedented shifts in technology, the economy and demographics, CHCI is stepping up to forge ahead and seize opportunities so that when 2030 arrives, young Latinos will lead, compete and succeed. 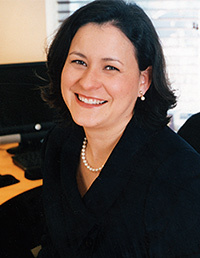 Esther Aguilera is the President and CEO of the Congressional Hispanic Caucus Institute.